A too prevalent belief at the present time that a large area or body of water has a greater hydrostatic pressure than a connected tube rising from its base. A projector thought that the vessel of his contrivance, represented here, was to solve the renowned problem of the perpetual motion. It was goblet-shaped, lessening gradually toward the bottom until it became a tube, bent upward at c, and pointing with an open extremity into the goblet again. 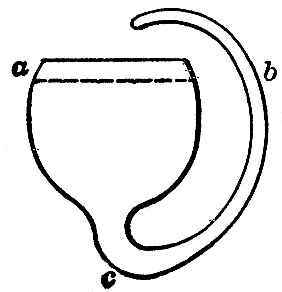 He reasoned thus: A pint of water in the goblet, a, must more than counterbalance an ounce which the tube, b, will contain, and must therefore be constantly pushing the ounce forward into the vessel again at a, and keeping up a stream or circulation which will cease only when the water dries up. He was confounded when a trial showed him the same level in a and in b.